No two weeks are ever alike for brewer, beer enthusiast and entrepreneur Jane Peyton. She chats to MT about opera, chocolate, and designing her own brew. 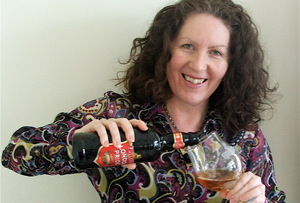 At School of Booze, my mission to is change people’s preconceptions about beer and cider. I set it up a few years ago because it was high time I had my own business, having been self-employed since I was 25 years old. It’s a corporate entertainment company mainly, providing tutored tastings, but I do the odd public tasting event, averaging about six classes a month. I wanted it to be called the University of Booze initially, and even registered the domain. But luckily a Business Link adviser told me to double check that I could call myself a university. Turns out that it’s a protected name in this country! Believe it or not, it takes a lot of discipline to really learn about beer. I trained at the Wine and Spirit Education Trust, and the Beer Academy. You can teach yourself but when you’re working with big oil firms or banks, it’s important to have some credibility. You don’t want them to think you’re just some twit who's been down the off licence. I like to keep busy and have half a dozen other projects running alongside School of Booze. I love opera, and run an event company called Operalicious. It’s not your average, bog standard opera dinner. At these events you actually learn something about the opera. Say a client wants to do Carmen, the opera is set in Spain so all the food and drink will be Spanish – chorizo, cava and sherry. Arias are sung between courses and I provide lots of interesting facts about composer George Bizet and the opera. My other passion is brewing. I’m currently working on two collaboration beers with the Botanist Brewery in Kew. I’ve come up with the recipes, and the beers will be ready in time for Father’s Day so that people can bring their dads for a special beer and food matching event. Beer goes well with all kinds of food, but especially with cheese, dessert and chocolate. If you want a real treat, pick up some cracked black pepper dark chocolate from boutique chocolatier Merry Berry and team it with a Belgian fruit beer like Bacchus Kriek or a Meantime wheat raspberry beer. It’s awesome. And next time you order a creme brulee for dessert, make sure you order an Innis and Gunn beer to go with it. Nevermind the Beaumes de Venise.